Is it recommended to give your GSD puppy any vitamin supplement? i would like to know if it is useful to add some vitamin supplement to this diet or if we are just doing fine, the little pup looks happy but we just want to have a happy healthy dog. Total German Shepherd:If you want to add supplements in the form of foods such as plain yogurt or cottage cheese then I highly encourage this - a spoonful or two per meal. Why? 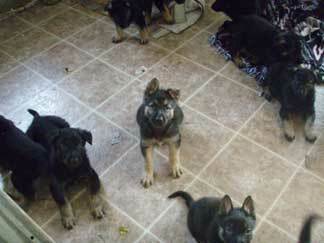 Because these foods offer calcium which a maturing GSD puppy needs. I don't really encourage adding milk to a dogs diet as many can't take it without terrible stomach upset but most puppies readily eat up cottage cheese or yogurt with no problems at all. Note: If you decide to add yogurt or cottage cheese (both plain flavored only) to your pups meals I would do it separately at the beginning or end of the meal to make sure that the dog eats it all because it will go bad if left out unrefrigerated over time and that's no good. Plus, if you just mix it in with the food before you're sure that your German Shepherd puppy will eat it all at one sitting then you will have to throw the unfinished dog food/yogurt mix out because the added cottage cheese/yogurt will not last for very long at all once put on the dog food and you don't want to upset your puppies stomach with the new addition if it decided to come back hours later and eat this soggy mix.